Turlock Irrigation District in Stanislaus County is utilizing approximately 5,200 acre feet of recycled water every year, freeing up traditional water resources for other beneficial uses. Turlock receives their recycled water from the City of Turlock, the City of Modesto and Hilman Cheese Factory. Reclamation District 108 in Colusa County is phasing in new water measurement devices to allow them to accurately measure the amount of water they deliver to their customers, as required by the Water Conservation Act. Surprisingly, many districts do not measure the amount of water they deliver to their customers. By knowing precisely how much water they are delivering, RD 108 will be able to provide their customers with enhanced feedback about how efficiency could be improved. Alta Irrigation District in Tulare County has been charging their customers based on the amount of water they receive for over a decade. Many other districts currently charge either by the acre or by the number of times a grower irrigates during a growing season, even though the Water Conservation Act requires them to begin charging at least in part by volume. By pricing water volumetrically, Alta is providing its customers an incentive to become more efficient. At the end of 2009, the California Senate passed a slate of water-related bills designed to improve water efficiency across the state. 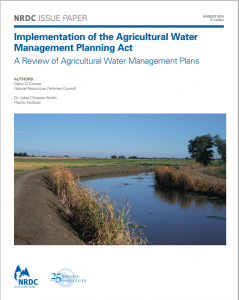 The Water Conservation Act of 2009 (SB X7-7) applies to water suppliers with at least 25,000 irrigated acres and required agricultural water suppliers to submit an agricultural water management plan by the end of 2012.